As Genetico, he participated in the first Guapos U class. He wasn't one of the top wrestlers in the group, but showed enough that he was given the gimmick of Sagrado: a religious wrestler with the blessing of Fray Tormenta. That should sound familiar; when Sagrado didn't get over due to his work, they recycled the same concept a year later, and gave it to Mistico. The similarities between the two characters have been downplayed for the most part. Now Sagrado is a CMLL rudo midcarder. When he started with the Sagrado gimmick in 2003, he wasn't very good, but he developed into at least a generic tecnico before turning rudo and becoming a faux Puerto Rican. 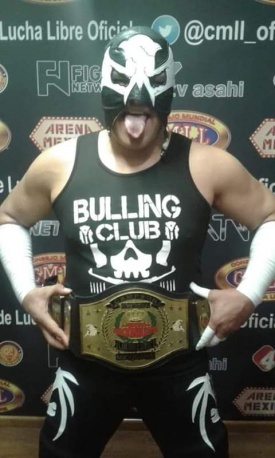 Unfortunately for Sagrado, his early problems diminished his initial push, and he was just another guy in limbo until he was assembled as part of a random trio with Maximo and Texano Jr. and won the Mexican National Trios Championship. The pattern of being another generic tecnico continued until he turned rudo, becoming a generic rudo for a while. in 2014 he teamed up with the latest Comandante Pierroth and Misterioso Jr. and discovered that both he and Misterioso Jr. were Puertorican at heart and that was the key to their success. El CMLL como premio a llegar ala final del certamen de los Guapos tenia dos opciones para lo que llegaron a esas instancias, el ganador el cual fue el Terrible paso a ser luchador estelar ya como parte regular de la Tercias de los Guapos junto a Mascara Magica y Shocker y el perdedor sele daria un personaje nuevo para la explotacion de el, pero con el apoyo en carteleras como fue Genetico el cual tras ser derrotado en la final opta por el personaje del Sagrado. Inicio de estelar pero no tiene como mucho angel para poder mantenerse en las estelares de grandes esenarios como Mistico o Mascara que seles esta dando el mismo apoyo que el. Mexican National Trios Championship, w/La Sombra, Volador Jr. This page was last edited on 25 February 2019, at 01:44.